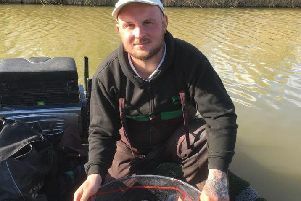 Andrew Bell with his magnificent chub. Fishing on the River Nene hasn’t been great since the turn of the year but one angler seems to be catching big fish wherever he goes on the river at the moment. Two weeks ago I reported on Peterborough & DAA bailiff Andrew Bell’s fine 29lb 12oz pike - one of the biggest ever recorded from the River Nene. He has now topped that though catching a specimen chub going to the scales at a whopping 7lb 2oz. I have caught chub many years ago to 6lb as I am sure a few other anglers have, but a 7lb plus chub is without doubt a magnificent fish and as it was weighed and witnessed will go down as one of the biggest ever chub taken from the river too. Two genuine specimen fish in the space of two weeks is never easy even on a prolific river let alone the River Nene as it has been void of colour and flow for months on end. With all the rain about over last weekend and the early part of this week it could be a very good time to fish the Nene. Barbel could well be on the feed as they like nothing better than colour and flow. Hotspots should be Orton Locks, Alwalton and Castor Backwater. Big smelly baits could work and the good old faithful lobworm is a great back-up if all else fails.